Today was the day and time has arrived: iOS 6 is now available. Those who never need to depend on the release jailbreak or software, you can now update your device from iTunes (actualizad to the latest version) or via OTA if you have a higher version to iOS 5.0 (Settings / General / Software Update). This new version brings some 200 new features, although the main focus on Siri, Maps, Safari, Mail, Facebook and passbook. 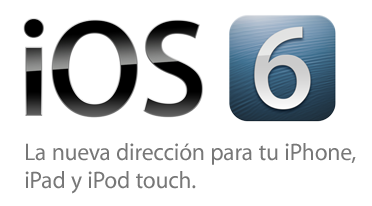 You can see all the news and limitations of iOS 6 in this post . Before you upgrade or restore, make sure you back up all data, either through iTunes or iCloud, to protect against data loss in case something goes wrong. We recall again that there is no jailbreak available now, so if you want to be able to do so in the future do not approach iOS 6 for now.